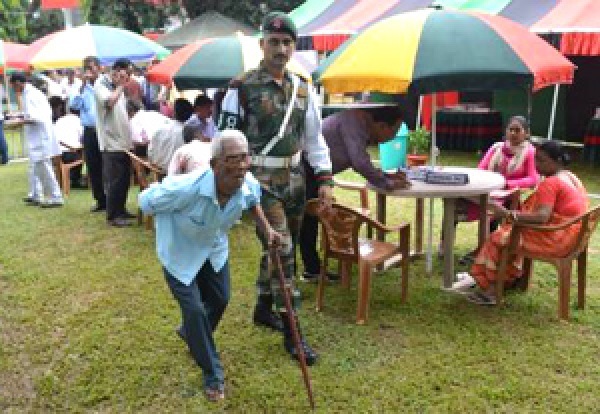 The 21st Assam Rifles under aegis of 21 Sector Assam Rifles organized an ex-servicemen rally at Kunjaban auditorium in Agartala of Tripura on Saturday. The event was inaugurated by Brig Ashwini Nayyar, Cdr HQ 21 Sector Assam Rifles. Dr Mahatme Sandeep, District Magistrate of West Tripura was also present on the occasion. During the rally, issues pertaining to pension related queries and welfare of Assam Rifles ex-servicemen were addressed. Stalls of ARGIS, ARESA, CGHS, PENSION CELL, SBI and PNB counter, CSD smart card were established to provide facilities, information and clarifying various issues. A separate medical and dental camp was also organized to address health related problems by a team of doctors. Brave women who had lost their husbands ad ex-servicemen above 70 years of age were felicitated by giving them gifts. The event received tremendous response where in a total of 210 ex-servicemen, 11 such brave women and 21 widows attended the rally. The selfless efforts of Assam Rifles were highly appreciated by all ex-servicemen, veer naris and war widows.